When Caroline Lucas stepped down as Green Party leader to concentrate on her role as their first and only MP in Brighton Pavillion, the chances that whoever took over as leader would end up being involved in the party leaders’ debate in front of millions of people was extremely remote. Thanks to the fragmentation of British politics, the refusal of Ed Miliband to risk tacking enough to the left to nullify attacks from there, and David Cameron’s insistence that he would only take part in a debate with UKIP present if the Greens were there too, the Green party leader WAS included in the leaders’ debate. Thought they are maintaining remarkable discipline in not saying so too publicly, I would be highly surprised if most Green party supporters are rueing the fact that Nathalie Bennett was up there on the podium and not Lucas. This could be a once in a lifetime opportunity for the Greens to establish themselves as a mainstream political party. It is worth remembering that they started life as an environmental pressure group, then realised during the 1980s they needed to be inside the political system to have a chance of achieving their aims. The Ecology Party that was formed became the Green Party towards the end of the 1980s and for 20 years refused to appoint a leader, wanting to continue their approach of all party consensus and feeling having the leader was against their philosophy of working as a team. Yet the need to have a figurehead around which the party could coalesce, and who could then be responsible for explaining the party’s message to the country, particularly in front of the mass media (whose influence has grown so much over the past 20 years) led to Caroline Lucas being appointed leader in 2008. Such was the advances they made, in terms of media profile and a sense of a real alternative being offered, that it came as little surprise when, after a forensically targeted campaign, Lucas won a seat in the 2010 election. When Lucas stood down as leader in 2012 an election was held in which a turnout of 25% resulted in Australian-born journalist Nathalie Bennett being made leader. Amusingly, Bennett said that we shouldn’t be surprised at the low turnout given the election was held in August (why couldn’t they have waited until September?!). Bennett has managed to continue in this vein of at times rather adorable incompetence by being involved in some of the most excruciating media appearances it is possible to have in the run up to an election. The Andrew Neil interview, where she talked of policies to raise about £20 billion to fund a policy (Citizens’ income) that would cost about £280bn was one thing. Then came an LBC interview in which she had a “brain fade” when asked how much a house building policy would cost. 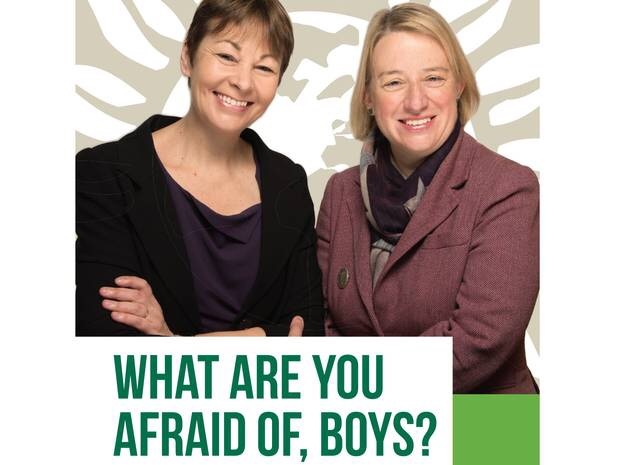 Following this was a farcical press conference in which Green Party peer Baronnes Jenny Jones (who had thought about turning down her peerage but thought better off it) refused to let Bennett speak to explain/defend the interview and Lucas suggested the problem was that they were women, not any incompetence. Then, to open the leaders’ debate, Bennett, with over a month to prepare a one minute opening speech, read it out from a piece of paper, barely engaging with the camera, and thus the audience at home. The contrast with the other leaders was palpable. Yet, the contrast is important. Bennett refused to attack any of the other leaders personally. Bennett Didn’t bluster on and on and didn’t have to be interrupted by the debate moderator Julie Etchingham. In fact, she was helpful to Etherington by coming to a full stop in what she was saying so efficiently that Etchingham found it easy to move on after what she said as the others weren’t aching to defend themselves or respond in a mother way after she spoke. The reason for that is even more important as a distinguished between the message the Green Party has to us and that of the other parties. Their policies are about the long term. They are unapologetic about the short term economic impact of some of their policies, in terms of how it might affect economic growth, instead claiming that we should be measuring ourselves in more than money, but in human health and happiness. They are unapologetic about the short term cost of some environmental measures, arguing that it will be worth it to secure the future of the world’s ecosystem in the long term. Contrast the message of the Greens with some of the short-termism of the other parties: Labour with their constant interference with the price and wage mechanisms for short term political gain at the expense long-term investment needed in our industries. The Conservatives with their promises of unfunded tax cuts for the middle class (which is what is achieved with the raising of the personal income threshold and the threshold for paying higher rate tax) when we still need to clear the deficit. The SNP and Plaid Cymru with their insistence that austerity isn’t necessary without any explanation as to how ending it would clear the deficit. UKIP with immigration controls and pulling out of the EU with little explanation of how this would help our jobs and goods and services markets. The Greens do have a proper alternative message. I just wish the messenger were more effective. If it were, maybe they would be on track for much more political influence in a month’s time.